This final report of the Commission on Inclusive Education (the commission) is the culmination of a year of study, research, public consultation, and ongoing dialogue with Nova Scotians. We know how important it is to Nova Scotians that we get this right. That’s why we undertook a number of steps in fulfilling our responsibilities. Listen to award-winning journalist Pauline Dakin interview the Commissioners about their recommendations for a new model of inclusive education. Download the audio in MP3 format. The new model is a multi-tiered system of supports (MTSS) that is specific to the Nova Scotia context and addresses students’ academic, social-emotional, and behavioural needs in an integrated way. 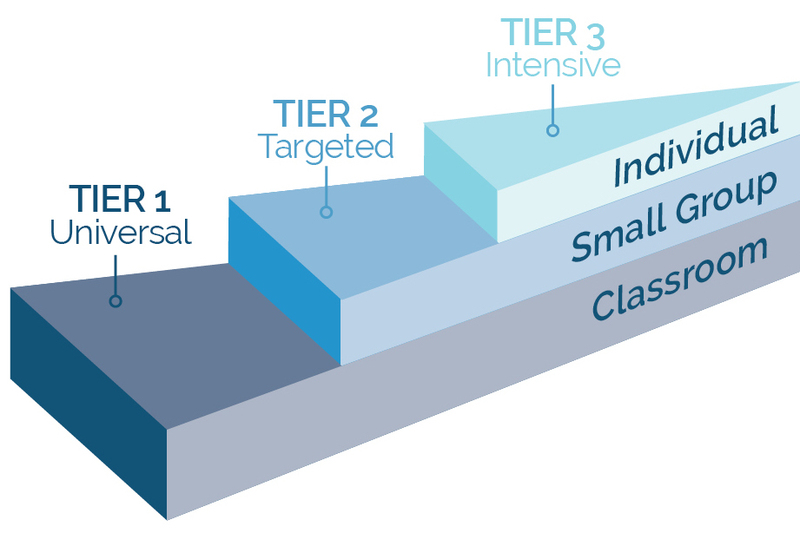 The three tiers form a flexible, interconnected continuum of academic, behavioural, and social-emotional-health supports at three levels. While the model addresses the needs of those identified as having exceptionalities, it is not a model for what has typically been thought of as special education. It is a unified model of inclusive public education that responds to all student needs and aligns multiple changes at all levels of the public school system toward one common goal: increased student success. This model is student-centred and provides assessment, instruction, and intervention at three different levels, or tiers: classroom, small group, and individual. The vast majority of students will experience school success in the classroom through the core curriculum and core instruction. Some students require additional educational programs, services, interventions, and settings at various points in their schooling to meet their unique strengths and needs. We wish to be clear that we are not advocating placement on the basis of differences, but rather a system that is flexible and able to respond to students’ needs, including time out of the main classroom if—and only if—that is what is required to assist the student and provide true equity. The current model of inclusive education was put in place in 1996. It was not designed to accommodate the volume of overlapping academic, behavioural, and social-emotional challenges experienced by many students today. The highest priority areas for improvement are behavioural challenges, mental health, literacy, mathematics, and life skills. The system needs more resources; delays in responding and failing to address student needs deny children their right to a good education and lead to poorer outcomes. Teachers and administrators feel ill-prepared to meet the demands and challenges of inclusive education. Silos exist at all levels and need to be torn down. Parents need to be true partners. Educators need time to collaborate and problem solve. We need a plan to make this work so it doesn’t become another report on a shelf. The following Blueprint for Change includes our recommendations at a glance. A strategic plan and a five-year implementation plan is available in Section 8 of our full report. In Nova Scotia, we have a strong foundation on which to build, including widespread commitment to the concept of inclusion itself, and hard-working and creative educators who have shown us innovative ways to address challenges. Our hope is to see this vision realized so Nova Scotia becomes recognized as a leader in inclusive education—with teachers who feel engaged, effective, and supported, and all students living to their full potential. Nova Scotians will not wake up to a fundamentally reformed education system the morning after this report is released. This change will take time, resources, and collaboration. It will take everyone working together to make this successful. This has been a challenging, but ultimately rewarding task. We thank the citizens of Nova Scotia—but most particularly the students—for the privilege of doing this work on your behalf.